An Enterprise Architecture Framework is a basic structure (like a method) filled with a set of tools, such as reference models, which can be used for developing a broad range of different architectures as part of enterprise architecture. Definition 1: An Enterprise Architecture Framework is a basic structure (like a method) filled with a set of tools, such as reference models, which can be used for developing a broad range of different architectures as part of enterprise architecture. Dragon1 and TOGAF are examples of these kind of Enterprise Architecture Frameworks. Definition 2: The overview, skeleton or structure of the enterprise architecture of an organization and its sub-architectures. This structure reveals the parts or components the enterprise architecture framework consists of. For instance what sub-architectures are recognized and for what sub-architectures there are architecture principles and visualizations available or defined. The visualization on the top right of this page is an example diagram of this second meaning. Where did the Enterprise Architecture Framework Diagram go to? Too often organizations working with enterprise architecture do NOT have their enterprise architecture framework visualized. 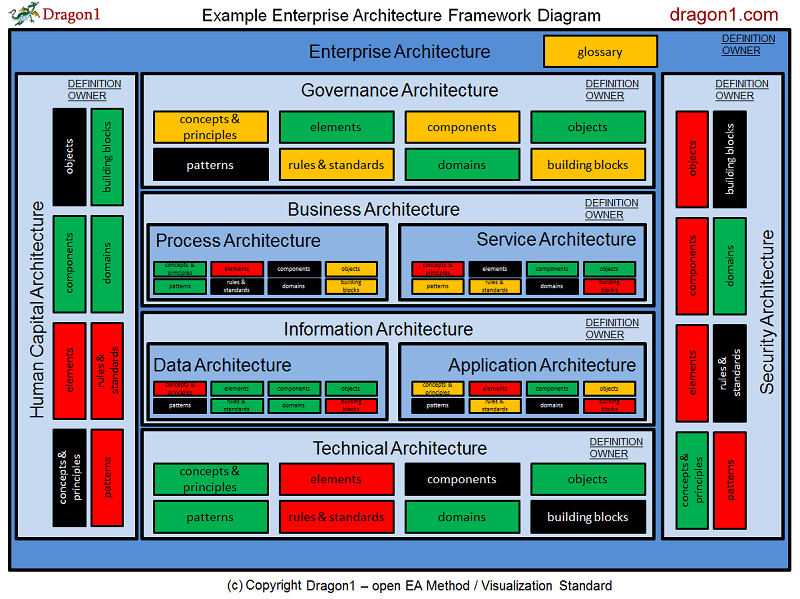 Dragon1 as open EA Method suggest to you as enterprise architect to create an Enterprise Architecture Framework Diagram as one of the first visualizations to create. If you create it for your stakeholders they will have much control over working with Enterprise Architecture in the organization. Dragon1 enables you to create a conceptual blueprint for the organization and strategy using an innovative Enterprise Architecture as Strategy approach. Do you want to create EA Framework Diagrams? Create your Trial Account today. On Dragon1, templates are available to be more productive creating frameworks.